In spite of their proliferation at national and supra-national levels, evaluation of whether counter-terrorist measures are actually effective is worryingly inadequate or, sometimes, simply non-existent. In this short essay I argue that the expansion of counter-terrorism in the past fourteen years has had, and continues to have, serious implications for human rights (not only of suspected terrorists, but of all of us), for democracy, and for the Rule of Law. As a result, part of assessing the justifiability of maintaining (and expanding) these measures must be to establish that there are not only prospectively necessary and designed with rights concerns in mind (the arguments made in justifying introducing them), but also actually effective and proportionate. In order for us to truly assess the effectiveness of a counter-terrorist measure and the robustness of the underlying necessity claim, we must assess the extent to which they meet both meta-objectives of security measures per se and the specific objectives of these measures in as comprehensive, rigorous, and open a way possible. Current practice is, however, not to do this in a systematic manner, meaning that counter-terrorism continues to expand on the basis of prospective arguments as to its necessity and appropriateness, claims for trust on the part of governments and, ultimately, shaky evidentiary bases. Last week I visited Oxford to present a live Oxford Human Rights Hub ‘webinar’ on counter-terrorism in the EU, including an analysis of the proposals for reform after the the Paris attacks of the past year. The webinar can be accessed online here (audio + slides). The attacks in Paris in November 2015 resulted in a wave of counter-terrorism law and policy reform proposals at EU level. In the webinar, I outlined these reforms, placed them in the wider context of EU counter-terrorism, and critically engaged with them from a human rights perspective. 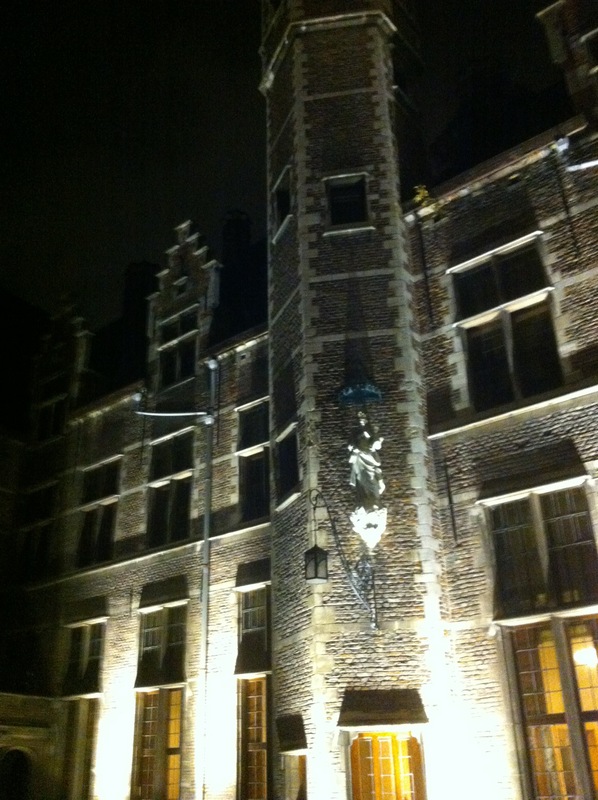 This week I am at the beautiful Universitair Centrum Sint-Ignatius Antwerpen (part of the Quad at night pictured left) for an excellent and challenging workshop on Socially Responsible Innovation in Security. I have been asked to present one of the four framing lectures, mine on evaluation and effectiveness. Although the lecture builds on findings and thoughts that began to develop during my FP7 project SECILE (results reports in this book from Routledge), it is not a typical ‘scientific’ lecture inasmuch as I do not focus on presenting concrete results. Rather, in this lecture I make an argument from principle on the importance of ex post facto effectiveness review and the inadequacy of ex ante impact assessments no matter how well designed. The full text of the lecture, which will be developed into a chapter for the Centre’s annual publication, is here. The introduction gives a flavour. In the past 14 years there has been an enormous expansion of counter-terrorism laws and policies at national, regional and international levels. Spurred on by the events of 9/11 and, later, the phenomenon of ‘foreign terrorist fighters’, states and international institutions have introduced laws and policies that encroach greatly on fundamental freedoms and human rights (at times in ways that undermine the democratic process), and the international conception of the ‘rule of law’ has been ‘securitised’ to a striking degree. These measures include measures to permit, require, and fund technologically innovative approaches to counter-terrorism: surveillance, smart borders and so on. While these measures raise particular questions flowing from the technologies applied, this paper take a step back from the specifics of technology innovation in security to address a matter of structural, ethical and deliberative concern across the field of security: effectiveness. Evaluation of whether counter-terrorist measures—including those using innovative technologies—are, in fact, effective is worryingly inadequate or, in many cases, simply non-existent. In this lecture, I will outline the expansion in counter-terrorism and its impact for human rights, democracy and the Rule of Law in order to argue that evaluation of effectiveness is key in maintaining the legitimacy of the counter-terrorist state and supra-state. Having done that, I will explore what the notion of ‘effectiveness’ means in this context, identifying both meta- and specific objectives as critical sites of analysis. Based on this, the paper will argue for the implementation of critical, reflexive and comprehensive ex post facto effectiveness evaluation of counter-terrorist measures and evaluation.